If you've ever been to a PianoEasy class you know that everyone has some musical ability. Playing an instrument doesn't come naturally to everyone, but everyone who can hear a melody or see a rhythm being played has a basic understanding of how music is created. It's a shame that, despite this, so many people are apprehensive about playing music. That's why Make Music Day exists. 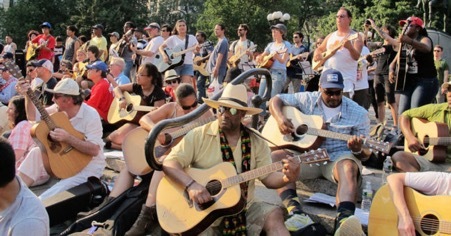 Make Music Day invites everybody to be a musician. It began in France in 1982 and has spread worldwide, so that in more than 120 countries, the summer solstice is a day where music is unavoidable and everybody plays. If you're keen to join in with some amazing events like these, the good news is that Australia joined in Make Music Day for the first time on the 21st of June 2018. There were 100 events held in 80 locations across the country, and hopefully there'll be even more next year. Keen to get involved? Check out Make Music Australiaor see how other countries have been making music together.